The Celtics and Lakers are struggling and I’m Happy! The Celtics and Lakers were highly favored coming into the season. LeBron was supposed to be starting the Lakeshow vol. 2 and people were actually debating whether they could beat the Warriors. With Kylie and Gordon returning to the Celtics, they were the favorites for making the Finals. Today both teams are proving to be paper tigers. LeBron’s Lakers are looking like the Michael Jordan Washington Wizards and Kyrie’s Celtics are playing more like a bunch of strangers than a team with title plans. As a Pacers fan, I can’t help but laugh. Even with Oladipo, most didn’t think the Pacers would even win more than the 48 games they won last year. Sure there were a few people that said that they could probably finish in the top 4 but everyone everywhere believed that the Celtics would be head and shoulders better than them. I believe it should be pretty clear that the Celtics are no better than the Pacers were with a healthy Victor Oladipo. Here’s the kicker, they might be a better team than the Celtics without Vic! The Lakers might not even make the playoffs. They’re in 11th place right now and trending in the wrong direction after losing to the Pelicans and Grizzlies. The Pacers blew them out by 42 points. That will be one of my favorite moments of the regular season. Something else that makes me laugh is the media. Twitter is roasting both teams right now. The media is obsessed with the Lakers and Celtics. They just relish in watching them flounder around and they will dominate the news, talk shows, and podcasts. Meanwhile the Pacers still remain in 3rd place in the East and all I can do is . So long as he's not a Pacer, I will always derive happiness from seeing the downfall of team LeBron. I don’t dislike the Celtics or the Lakers. I don’t mind Magic Johnson. But I have increasingly come to dislike LeBron and it has been funny to see his “decisions” come back to bite him this year as he has begun his decline. Soon he will not be able to attract any players because he back stabs them and it is hell to play with and only get worse as he declines. Lol! Yeah with the Celtics struggling as bad as they are, looks like we will wind up with the 4th seed and likely facing the Celtics in the first round. We have a good shot to win that series. I don’t mind either franchise and respect their history. Kobe is my favorite non-Pacer of all time, so I always rooted for LA in their playoff runs aside from 2000 Finals of course. I also am a big Bird fan and really liked the Pierce/KG/Allen/Rondo Celtics. That being said, after many years of engineering rosters his way, I do think it’s hilarious to see something finally blow up in Lebron’s face. The decision to go to LA was a total disaster and he was a total fool to bank on that situation with Magic Johnson running the show - who has no clue how a real GM does things. Lebron made a horrendous decision from a basketball standpoint and should have known better. He deserves the consequences. Fine wirh me, I’m tired of watching Lebron lose a bunch in the Finals anyway. Last edited by Sollozzo; 02-27-2019, 01:11 PM. Why isn't Brad Stevens getting any heat for the Celtics being bad this year? He has done a horrible coaching job. Hayward still hasn't recovered which is a big hit to Boston. That's a lot of money the last two years. Hopefully next year he'll return to what he was. I've been hearing this all year long and I'm believing it less each day. Just Google "Boston Celtics struggles" and you will see that articles have been written every 2 weeks since the end of November with writers asking, "Why are the Boston Celtics struggling?" They're struggling and constantly making bad comments after losses to the media so there are some real chemistry/professionalism issues. On top of that, I think the rest of the league might've caught up to them as far as how to defend and attack them on the offensive side of the ball. Kyrie is a great player but the more he dominates the ball, the worse the rest of the team plays. It really is surprising but they were better without him last year than they are this year. I know that not everyone has been following these teams that closely but they've been really bad lately. Boston has lost five of its last seven games, that includes two blown 20-point leads against both Los Angeles teams, and beat downs by the Bulls and Raptors. The Celtics have a net rating of -4.8 during the last 5 games. Players are yelling at each other while on the court and Brad Stevens said that the team is taking shortcuts all over. Marcus Smart said that they're "just not together" like they were the last couple of years. 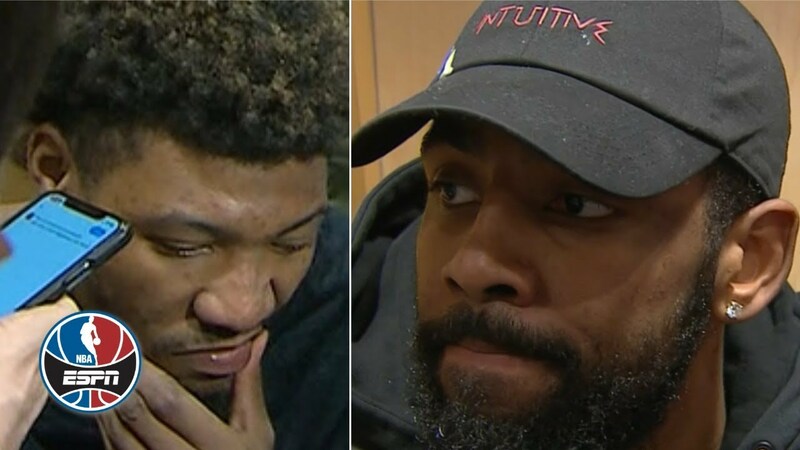 When asked about that after the game last night, both Kyrie and Marcus Morris declined to answer the question. Their problems are real. This is BS, they have two other wings on rookie contracts to balance it out. They have three starting level wings making about 45 million dollars combined, Hayward’s contract isn’t killing them, yet. Well, I would pretty much hate Lakers even without Lebron, but putting that douchebag in to despicable organisation and see them struggle is a real double-whammy! I know it does not explain the entire year of struggles for both teams but I do believe that for about the past month or so both team are involved in the Anthony Davis sweepstakes and well we all know that every player on both teams is up for grabs with the exception of Irving who may already have one foot out the door. It is very possible that the players do not feel connected to the future of the franchise and may not be giving it their all so to speak. Not professional for sure but also human nature. It'll be interesting if Kyrie opts out and signs somewhere else. Boston can get under the cap but won't be able to sign a max player to replace him. Toronto is in a worse boat with Kawhi. Their active roster cap will still be over the salary cap if Kawhi leaves to go to the Clippers (for example). I didn't start following Pro basketball until 1969. I jumped on the Celtic bandwagon because of Bill Russell and John Havlicek. I continued liking the Celtics (as my 2nd favorite pro team...favorite NBA team) in the 1970's with Havlicek, White and Cowens. Of course I continued into the 1980's with Bird, McHale and Parish. After that, I lost interest in them until Brad Stevens took over. I liked the Lakers in the early 1970's with Wilt, West and Goodrich. I haven't cared for them too much since then although I do respect their accomplishments. I wouldn't get too giddy about either team struggling, both have enough talent and time that they could still turn it around and have pretty good success. When the season is over, then I'll be ready to rub it in to the Lakers. Maybe the Celtics struggle enough that Stevens leaves and goes to IU?